The University of Louisville and University of Kentucky have announced receipt of a $3.76 million grant to create a national center of excellence in micro/nanotechnology. The highly competitive grant from the National Science Foundation (NSF) is one of just 16 awarded to universities across the country. More than 100 colleges and universities competed for the NSF grant. 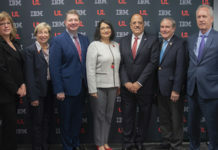 UofL and UK are joining a new national network that will make university facilities, tools and expertise in nanoscale science, engineering and technology available to outside users. Eight key nanotechnology and advanced manufacturing facilities at UofL and UK will become a collaborative center for academia, small businesses and industry to “make the next generation of smart products using the tiniest materials” according to Dr. Neville Pinto, UofL interim provost. “This will be a boon to Kentucky’s economic development future and support the ongoing work of UofL’s Institute for Product Realization in our new research park,” Pinto said. Engage more minorities and women in nanoscale science, engineering and technology. The announcement was made Sept. 21.